Pinar Yoldas’ turtles no longer have to carry the burden of a heavy shell around with them. They glide through the water suspended from a delicate blue balloon attached to their backs instead. 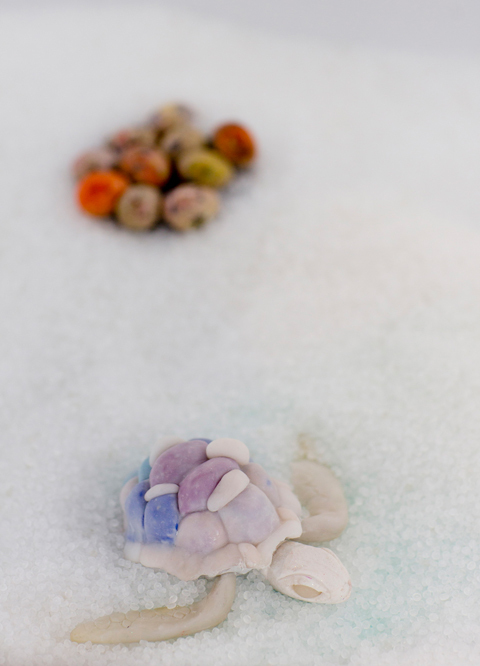 Maritime insects by the Turkish-born artist, who now lives in the United States, are hatched from colorful nests, her snails and snakes inhabit gossamer cocoons. In the “White Cube” of the Schering Foundation in Berlin, these cute little monsters are destined to embody “An Ecosystem of Excess”. How wonderful, we might think, an ecosystem of debauchery, of pure indulgence of shapes and colors! 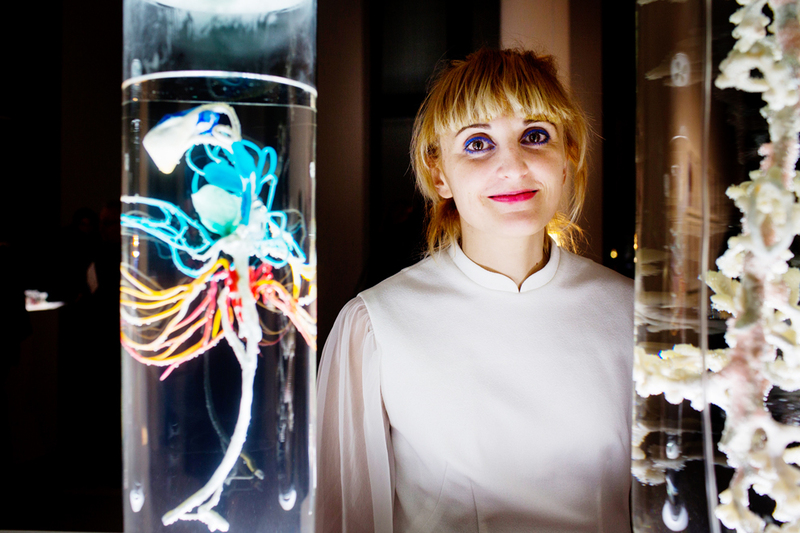 Until we realize that it is not a postmodern cabinet of curiosities that Yoldas has assembled with her creatures, but an imaginary lab that could easily be mistaken for the real thing: This disillusioning experiment in biogenetics is about the sheer oppressive quantities of excess in the form of plastic waste. 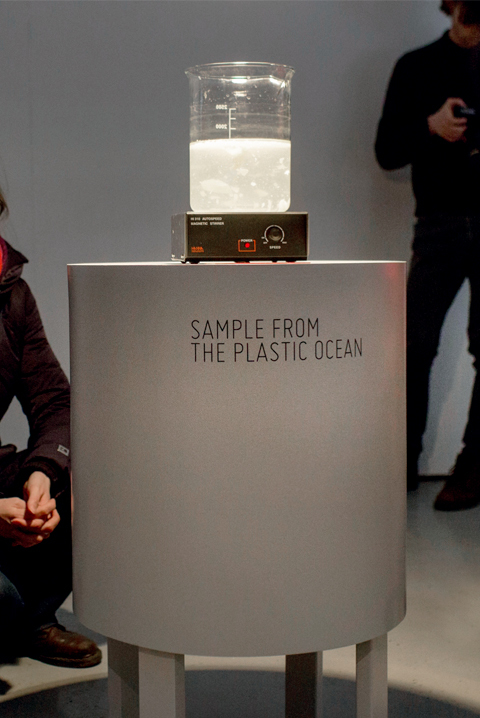 A vortex in a test tube, a maelstrom en miniature with a motley bunch of particles spinning around in it alludes to “The Great Pacific Garbage Patch”, a gigantic gyre of trash about the size of Central Europe. 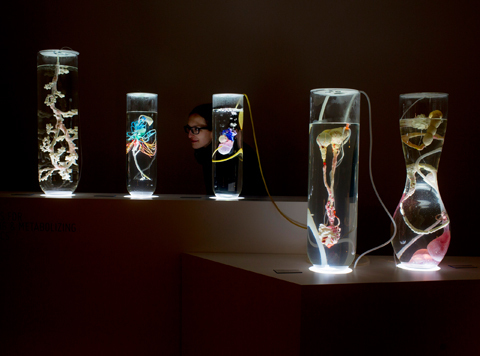 It was skipper and environmental activist Charles Moore who discovered this 21st-century “primordial soup”, and it prompted the artist to come up with a set of plastivores (digestive organs that can process plastic). Plastic eaters, in the strict Darwinian sense, are organisms that in contrast to humans will survive the pending trash deluge. Designed to fully adapt to this synthetic world, they feed on and utilize inorganic materials that have been flooding (not only) the Western world and smothering the planet ever since the 1950s. 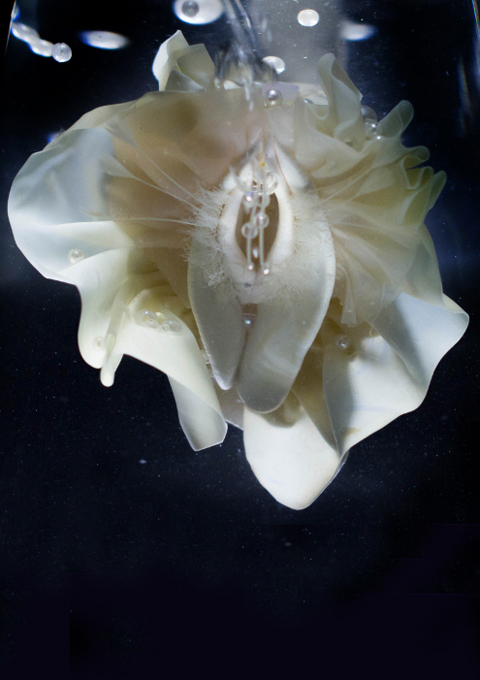 But bear in mind here that with her fantastic creatures Yoldas, who works closely together with Sylvia Alice Earle, a maritime researcher, has not simply dreamed up an arbitrary bestiarium, a collection of mythical beings evocative of the images of photographer[JG1] Joan Fontcuberta. Which is readily apparent from the way in which they are presented: A clinically white display composed of triangular and cuboid bevel-top plinths, a stylized kidney table, functional test tubes, petri dishes and Baroque-style beakers – the repertoire of formal containers alone suffices to demonstrate that the past, viewed with such skepticism, is being extended into the future. The coming evolution begins with carefully framed sketches of selected specimens of plastic fauna. 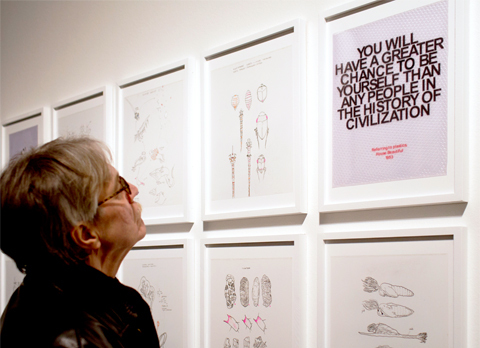 These images, taken from what could be a future edition of a classification book by Linné, are interspersed with faded 1950s prints: silkscreen collages from a commercial that has fallen prey to a craze for things synthetic, flaunting the slogan: “You will have a greater chance to be yourself than any people in the history of civilization.” This is juxtaposed to a contemporary variation on the journey of “self-discovery”, visualized in the dance around the Golden Calf in the guise of a nylon-stockinged female leg that extends across four or five stories. Previously, a bunch of hippies sought to counteract such aberrations from the history of mind, who with trenchant irony named themselves “plastic people”; it was a form of protest that was of as little impact as the Flower Power movement of their peers. Yoldas, on the other hand, pursues an unusual path by opting for natural history installations, the kind we may be familiar with from Mark Dion. A master of replication, Dion makes museum display cabinets, stuffed funfair sensations and computer-equipped research stations to confront people with the problematic relationship we have to nature today. Pinar Yoldas doesn’t go to such great lengths and instead offers the spectator a glimpse of the future. Albeit not by reading tea leaves – but by reading statistics. Her vivid interpretation of columns of figures succeeds in distilling what we tend to overlook in the everyday – and what scientist Susan Freinkel recently denounced in her book “Plastic: A Toxic Love Story”: micro-plastic parts as the base product of the plastics industry. 113 billion kilograms of these wafer-thin, transparent pellets (they’re called “nurdles”) are rolled out each year. The plastic powder enters the ecosphere unnoticed and uncontrolled, animals ingest the substance along with their food, which makes them feel full – and starve to death. Instead of fleshing out this horror scenario, which so many choose to ignore, Yoldas uses scientific calculation to present possible scenarios in a synthetic ecology: What if bacteria were able to break down plastic in a multi-chamber digestive organ (Yoldas calls this process “Stomaxim”)? What if animals with plasto-sensory systems were able to detect appropriate foodstuffs and filter contaminants through their kidneys (Yoldas: “Petronephros”)? “Metabolism” is the name Yoldas uses for the artistic realization of this scientific thought experiment. In contrast to the eponymous stylistic movement endorsed mostly by Japanese architects, who developed upbeat concepts for the future, today we find ourselves powerless and fatalistic, following in our minds the forecast paths the soon-to-be environmental disaster is going to take. 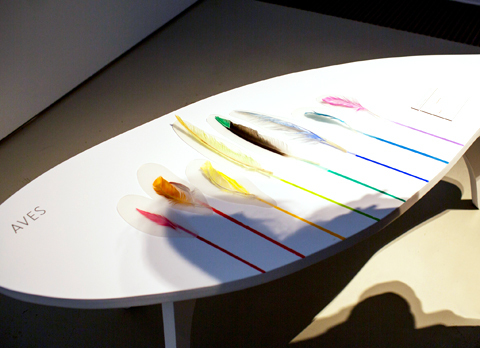 In other words, what we face is an “evolution” derived from a familiar pattern, boasting prima facie colorful yet ultimately fatal eccentricities: feathers of plastic birds fanned out on a table according to the Pantone scale. In homo sapiens’ synthetic world of consumerism these shades guarantee maximum sales appeal, and will soon also determine sexual selection during plastivoric mating rituals. The above scenario was conceived in a “trans-human” manner, that is, with the exclusion of the – very specific – species of man. Which flies in the face of our ongoing efforts as masters of adaptation to be forever at the forefront of evolution. A prime example is man-made color inventions: 18th-century mercenary armies, who liked to parade in full splendor, used apple green or poplar green, bleu mourant and pike gray, or crimson to distinguish themselves from one another. And when in World War I artillery barrages, aerial bombing, chlorine and dichloroethyl sulfide forced soldiers to take cover and don field gray uniforms for maximum inconspicuousness, the chemical industry was quick to compensate by introducing aniline colors such as resorcin yellow, azoflavin, supranol brilliant red and methylene blue into the civilian world. Modern man embraced all these eccentricities, mostly with enthusiasm, intoxicated by the gleaming new possibilities. Whereas Medieval man tended to view aberrations and anomalies in nature, monstrosities such as acephales and sciapodes (i.e., headless forms and one-legged creatures with a giant foot), as divine interventions, as calls from above that they change their ways. Today such occult mysticisms will just about do if you want to found a religious cult. 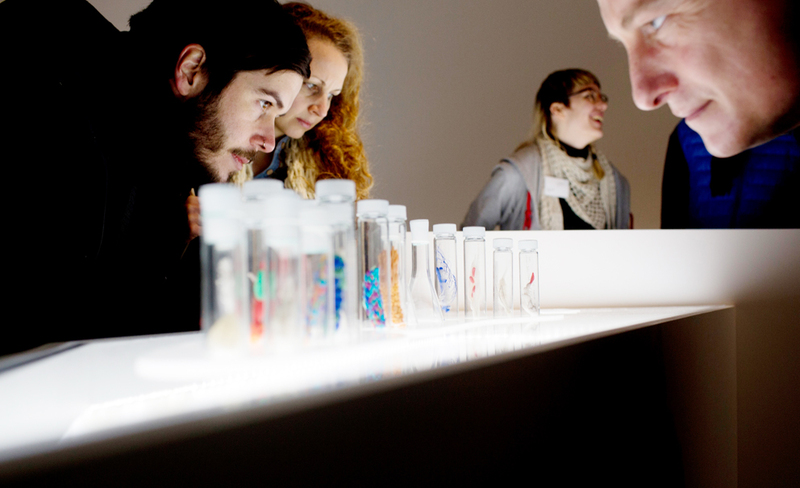 Which is why Pinar Yoldas has opted for a scientific exhibition design, i.e., the persuasive power of lab experiments. In keeping with the suggestion by Francis Bacon (the 17th-century philosopher that is, not the painter) that genetic deformations deserve our special attention because they serve to stimulate human inventiveness. And foster an appreciation that only a radical change in the way we live can prevent the Plastivorizene (i.e., the age of plastic-digesting living creatures), which would no longer be livable for humans. Which is a shame really. 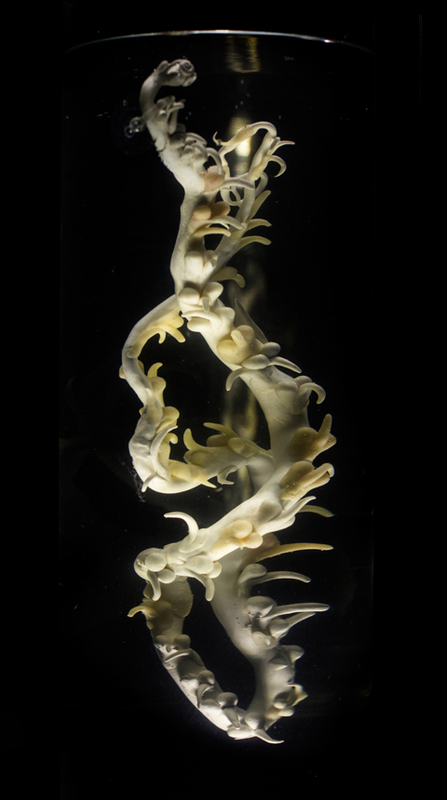 Because in the Yoldas’ lab the new world of Chelonia Globus Aerostaticus and Dermochelys Oris Scortum, the habitat of the Pacific balloon turtle and her sister, the shredder turtle, looks really rather beautiful. Plastic: A toxic Love Story. 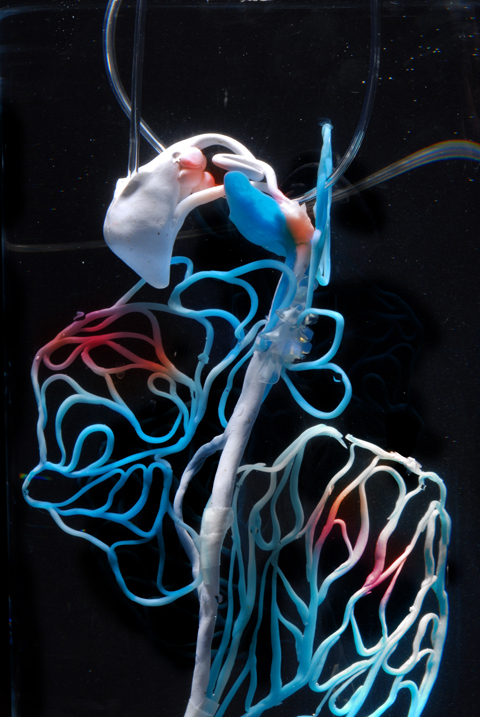 Pinar Yoldas, "P-Plastoceptor: petrosensory organ", polymer clay, 2013.